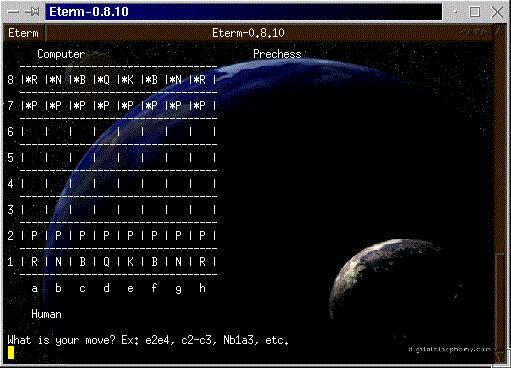 A previous and experimental version of a chess program in Ada 95. Version 0.7.8. Now with better Winboard/Arena support in Windows Text Version (can accepte for example "draw agreed") and with a colorization that allows to know what was the last moved piece in Windows Graphical Version! But, please, read the following lines. AdaChess: PreChess was made without any knowledge of chess programming and without see any other chess program source code. Even Alpha Beta search had not been implemented. So, from now on program PreChess will be kept just for historical reasons and I will be working (with Stan Arts from Holland) in what will be called AdaChess http://sourceforge.net/projects/adachess/ a completely new program, where, at least, alpha beta search will be implemented. New versions of PreChess still will be coming, however less often. 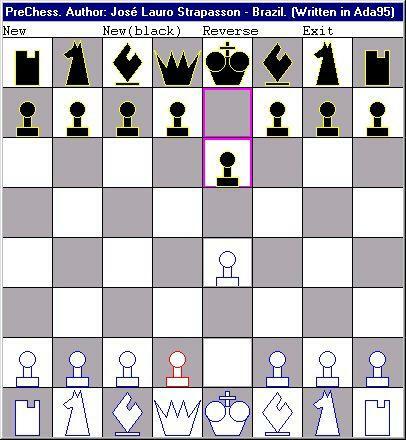 This program alows the player to do all moves of chess but the program doesn't do all. There are limitations in casteling, En passant, etc, but affect only the program and not the player. It doesn't know what is draw and specialy draw by 3-fold repetition. The program was completely done in Ada 95 and is FreeWare and Open Source and is shared in a BSD like license. I thank my brother Rogério for testing the program many times and my brother Reinaldo. 1-It doesn't know what is draw by 3-fold repetition. 2-It doesn't know what is draw by 50 moves. 3-Maybe there is a problem in "en passant". 4-Windows text version can't play as second engine in WinBoard, only plays as first engine. Text version for Windows With support to Winboard/Arena! Other OS. One can compile the source code of the text versions without Winboard support (Winboard=false in the file xboard.ads) to any other operating system using Gnat or another good Ada 95 compiler. Source Code comes with the files. By the way Linux version doesn't work with XBoard yet.